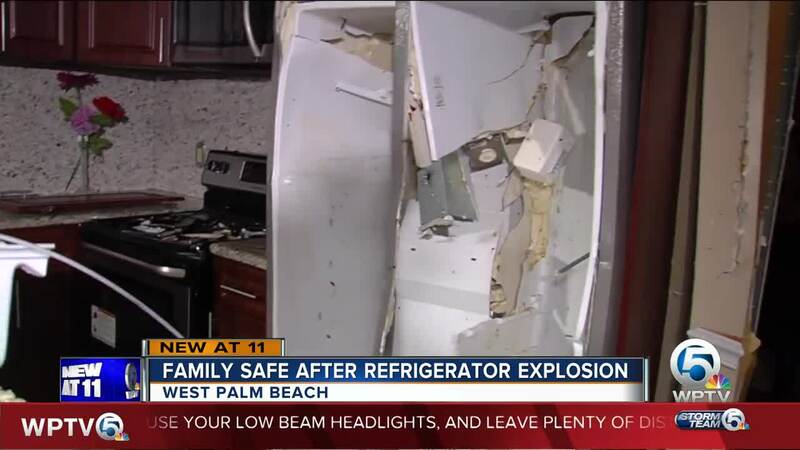 WEST PALM BEACH, Fla. — A Florida family is grateful to be alive after they say their refrigerator exploded inside their home Saturday morning. The force was so powerful it caused significant damage in several rooms. Luckily, neighbor Joshua Perez heard the explosion and ran inside to help the family get out safely. “I was in my room, I was asleep and I just heard the bang,” Mark Ligondie said. Ligondie quickly ran from his bedroom to the kitchen where moments before his parents' refrigerator in the West Palm Beach, Florida home exploded. “There were fumes coming everywhere,” Ligondie said. He says the odor was so strong and that it made his eyes sting. “The fridge exploded and if you look at this angle right here it expanded and expanded so much it bent the metal of the stove,” Ligondie said. The family's 4-month-old Whirlpool refrigerator was in pieces, scattered throughout the kitchen and surrounding rooms. Their next door neighbor, Perez, rushed over to help after hearing the loud bang and smoke alarm. "Immediately I just see the smoke,” Perez said. Luckily, no one was hurt. The fire department showed up and cleared the home. “And for them to say we’ve never seen this, this is something we have never seen in our life is kind of alarming,” Perez said. Perez believes this incident is a wake-up call for all homeowners. “I’ve actually scheduled an appointment already because of how nervous this has made me just for general maintenance and I think that’s something everyone should do,“ Perez said. WPTV reached out to Whirlpool for comment. We are still waiting to hear back. Meanwhile, there's now cracks in the family's ceiling and nearby walls, damage to the master bedroom door and a bedroom window is missing.